He is a lieutenant colonel in the Philippines army reserve. He taught himself how to play piano. In December 1998, he claimed the WBC flyweight belt by defeating Chatchai Sasakul. When Pacquiao was a child, he wanted to become a priest. He gave himself the boxing glove tattoo on his chest when he was just 13 years old. He completes 2500 sit-ups on a daily basis during his training camp. He used to climb a mountain several times a week as a child. His nickname comes from the first three letters of his first and last name - not from the popular video game. In 2009 he became the first Filipino athlete to ever be listed as one of the top 100 influential people in the world. Manny became a Congressman, and is now a seating Senator of the Republic of the Philippines. His wife is a Vice Governor. His dog, who also goes by the name Pac-Man, goes on a run with him every morning. The Philippines government has awarded him two titles: the "National Fist" and "National Treasure". Manny's first album went platinum in the Philippines. Apart from being a world-class boxer, Pacquiao plays chess and a decent billiards/pool player. Before Pacquiao became a successful boxer, he worked as a gardener and construction worker. He also used to sell donuts and chilled water on the streets. Actor Sylvester Stallone, who’s quite fond of the boxer, wants to work with him in a movie. He is the first Filipino athlete to appear on a postage stamp. Pacquiao, who runs a charitable foundation, provides educational scholarships to 250 children. He starred in films such as "Wapakman", "Anak ng Kumander", and "Brown Soup Thing". Manny has had the same assistant trainer since the beginning. Manny's first fight was against a group of bullies who were teasing his younger brother. His first professional fight was on a TV show in the Philippines called "Blow By Blow". Manny starts every morning with a reading from the Bible. 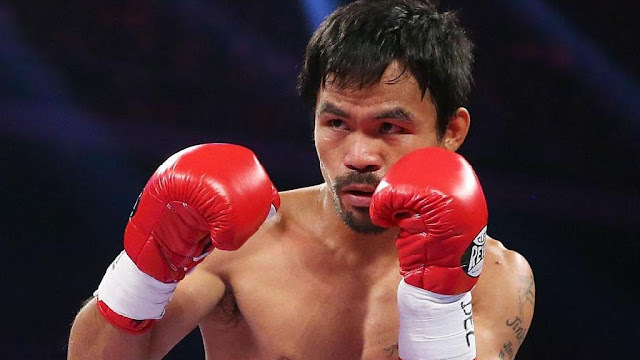 Pacquiao lives with his wife and five children in a luxurious mansion in General Santos City, Mindanao. The mansion is secured by armed guards 24x7. Despite not being a part of the team, Pacquiao carried the flag for Philippines at the Opening Ceremony of the 2008 Beijing Olympic Games. Former President Gloria Arroyo is a close friend of Pacquiao. Pacquiao’s first punchbag was made from a cardboard box stuffed with clothes. Pacquiao ranked number 11 in Forbes 2014 list of World's Highest Paid Athletes with a total of US $41.8 million. Of that less than US $1 million came from endorsements. Pacquiao also plays basketball. In fact, he’s the shortest man to play professional basketball in the Philippines. Pacquiao’s fourth child, Queen Elizabeth, has dual nationality because she was born in the U.S.A. She has 48 godparents as well. While training, he always carries a Bible. It’s believed that some of the verses are highlighted with a pink marker.